Emphasizing With Text — Slugline. 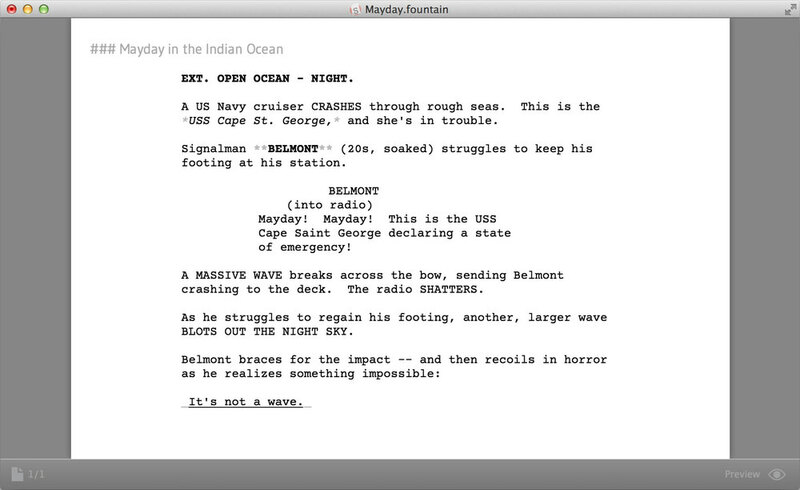 Simply Screenwriting. Pretty standard stuff. In addition to the Scene Heading, Action, Character, Parenthetical, and Dialogue elements, the writer has adopted the recent trend of putting a character's first appearance in bold as well as UPPERCASE. The ship's name is italicized, and there's some underlining for effect. EXT. OPEN OCEAN - NIGHT. A US Navy cruiser CRASHES through rough seas. This is the *USS Cape St. George,* and she's in trouble. Signalman **BELMONT** (20s, soaked) struggles to keep his footing at his station. Mayday! Mayday! This is the USS Cape Saint George declaring a state of emergency! A MASSIVE WAVE breaks across the bow, sending Belmont crashing to the deck. The radio SHATTERS. As he struggles to regain his footing, another, larger wave BLOTS OUT THE NIGHT SKY. Even in raw text form, the scene is eminently readable. This is the stated goal of Fountain—the plain text file should read like a screenplay. Notice that this readability extends to the emphasized text. The last line feels underlined because of the bracketing underscores. The ship's name *feels* italicized. The same characters that trigger Slugline and other Fountain apps to format the text, also cue the reader to "see" the emphasis in the raw file. The entire letter, in which Mamet urges his writers to eschew "clarity" in favor of drama, is a must-read of course—even in its bracing all-caps. Coming out of the gate with the internet equivalent of yelling, and presumably not trusting his email to reach every reader with rich-text formatting intact, Mamet emphasized choice words and phrases with the only option left to him: asterisks. It's easy to assume his points were made. Fountain's conventions for **bold,** *italics,* and _underline_ are inspired by (but not identical to) those of Markdown. Markdown's creator, John Gruber, recently dug into the history of the convention, and traced it back to an interesting pre-internet origin. I don't really care so much when or how the practice originated. I'm just delighted that a lightweight mechanism for marking the text emphasis that matters to screenwriters also happens to make for a wonderfully simple, human-readable text file. It's one of the things that makes Fountain work — and it works very well indeed.